Escanaba in da Moonlight is a comedy film directed by Jeff Daniels. The film was produced by Robert L. Brown and Tom Spiroff and written by Jeff Daniels and Guy Sanville. Escanaba in da Moonlight stars Jeff Daniels and Harve Presnell. The film is adapted by the play also written by Jeff Daniels. The story of Escanaba in da Moonlight takes place in Michigan, in a town called Escanaba, where many hunters live and work to keep their traditions alive. The film stars Reuben Soady, played by Jeff Daniels, who travels to a hunting school in the woods with his father, Albert, brother, Remnar and Jimmy Negamanee. 43-year-old Reuben is charged with the task of shooting a male deer before hunting season ends. If he fails to hunt down the creature, he faces the disapproval of his parents for having been the oldest in his family to not have completed the job. He will also be considered unlucky by those who live in town. Reuben is married to a Native American woman named Wolf Moon Dance, played by Kimberly Norris. She provides her husband with several traditional medicines to cure him of his curse and guard him against evil forces, including a drink made from animal waste. Ultimately, Reuben and his wife encounter a Department of Natural Resources Officer named Tom T. Treado, played by Randall Godwin, who asserts that he has seen God in person. Throughout the film, Reuben, Jimmer and the officer all become haunted by ghosts. One day, Reuben sprints into the woods wearing very little clothing and runs into his deceased great-grandfather named Alphonse. Alphonse helps Reuben to hunt down a buck he and the other spirits found for him. Reuben shoots the buck and goes back home victorious. 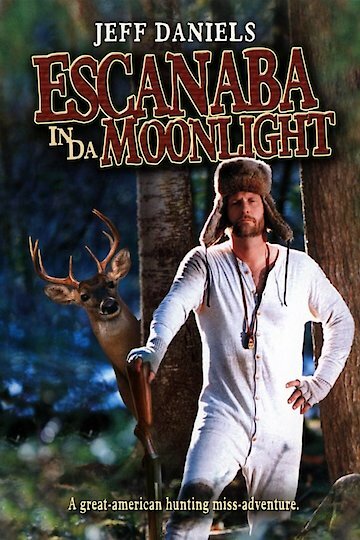 Escanaba in da Moonlight was released in 2001 in the United States. The film runs for 91 minutes. Escanaba in da Moonlight is currently available to watch and stream, buy on demand at Amazon, iTunes, YouTube VOD online.